Smallholder farmers experience many challenges and in recent years climate change has exacerbated these challenges. Our G4AW projects deliver specific information services on weather, rain and humidity forecasts, market prices, farming techniques and pests and diseases, via SMS or mobile application to support farmers increase their production, income and food security, and reduce their inputs of water, fertilizer and pesticides. Vietnam is currently the world's second largest producer and exporter of coffee, with over 500,000 farm households growing the crop. Robusta accounts for more than 95% of the output, while Arabica makes up most of the remaining 5%. 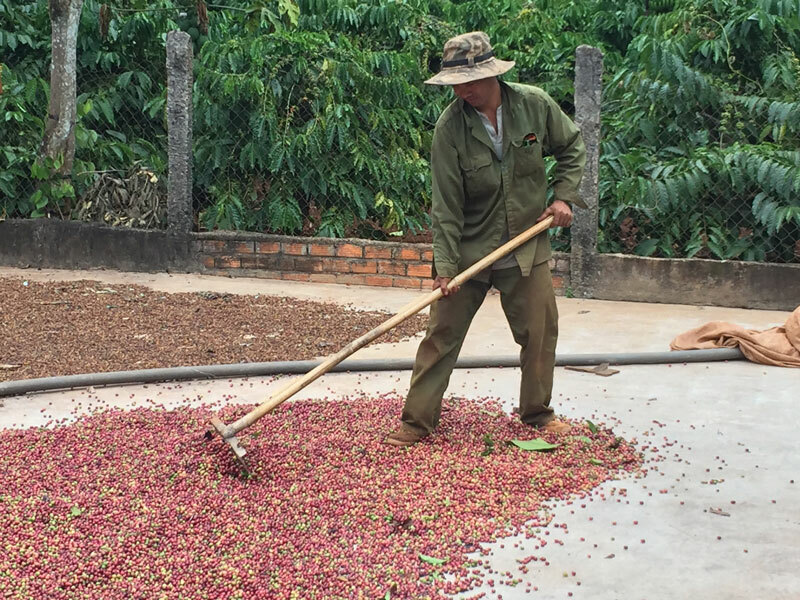 Coffee is important to Vietnam as it is the largest agricultural export product in value after rice, with a yearly export value of over USD 3 billion. The bulk of coffee is produced in the Central Highlands of Vietnam and about 95% of the total growing area is cultivated by smallholders. 80% of the coffee growers live in the Dak Lak, Gia Lai, Kon Tum and Lam Dong provinces of the Central Highlands and 30% of them belong to ethnic minority groups. Despite the income which coffee brings to the area, it is one of the poorest regions in Vietnam. Of over 400,000 farm households growing coffee in the Central Highlands, 95% are smallholders growing coffee as a mono-crop, with parcels mainly varying between 0.5 and 1.5 ha. Water resources are essential for the high yields obtained by Robusta farmers in Vietnam. The Central Highlands have large stores of underground water, which is replenished annually by the monsoon rains, and while overall rainfall volume is usually sufficient for Robusta coffee, uneven yearly distribution in recent years means the coffee crops require irrigation to continue achieving high yields. Groundwater makes up 56.6% of irrigation water in the region and the area is under extreme over-irrigation. The irrigation inputs of farmers in the region are substantially higher than the recommended irrigation input for maximizing coffee yields. Additionally, due to climate change, coffee farmers have faced excessive rains and prolonged dry seasons. Droughts have caused widespread production losses and water shortages. The shortage of water during fruit development delays the growth of the fruit and reduces productivity as the inferior fruit is unsuitable for marketing. Climate risk is also interlinked with quality and pests or diseases. Excess rainfall or humidity can affect quality by inducing fungal disease, fermentation in freshly harvested coffee cherries, or mould in stored coffee. In the Robusta areas, there is evidence of the coffee mealybug (planococcus lilacinus) which leads to losses, lower screen sizes, and reduced coffee quality. Significant investments are made on hardware, software and knowledge building during the first three years to set up the GREENcoffee service. After Year 1, the number of users and corresponding turnover for GREENcoffee progressively increases and by Year 3, the targeted number of farmers and B2B users are expected to be reached. Therefore, GREENcoffee services will become sustainable, or cash flow from operations will become positive, during the early part of Year 4 (after the project ends). There is a yearly subscription fee of EUR 4.20 that farmers will pay to keep the service going.